So, to start off, I don’t think I posted once in the entire year of 2018. Whoops. To remedy, I am making a schedule for my blog. At least once a week, if not more. I know that schedule can’t compete with someone like Peter Edwards at LittleFears who posts every day. Kudos to you, Peter. And, honestly, I have no excuse for this. I just ignored my blog last year. That’s it. I had every opportunity to write here and didn’t. It’s my fault. Sorry for that. Anyway, I’m hoping this new schedule will help a lot with that problem. On a higher note, my first fictional story this year will be ‘War of the Wolves’. It will hopefully be the new lifeblood of this blog. Also, for those of you wondering, ‘what’s going under that new tab on the home page’, it’s going to be this new story. Also, I do so believe this is the first story on my blog not directly inspired by the Mysteries of Harris Burdick. I’m quite proud of that. It is also the first story to be written by two. Yup. You read that right. Written by two. Me and… who? Me and my very good friend Andrew Schossow. Andrew, as of this moment, is starting a how-to-do-art style YouTube channel. Sadly, I cannot give you a name or link, as its name is, as of now, unknown. I will post some other time about this YouTube channel. Back to War of the Wolves. Just to clear up, it is deeply inspired by Kathryn Lasky’s ‘Wolves of the Beyond’ six-part series. It’s one of my favorites, and I highly recommend it. Check it out here. I hope it to be gargantuan, far longer than my standard two or three parts. Five, at minimum. I don’t even know the max yet. There is a world, a world far beyond our own, where all creatures have lived in peace. But not today. Today, that peace has shattered. Wolves and eagles have erupted into separate civil wars. The survivors of the initial attack fled to a world called the Distant Blue or the Beyond. There, five small, mysterious wolf pups rise to fight back. Will they succeed? Or will this entire war be all for naught? Yeah, I know it’s short. I didn’t want to spoil too much. But, eek, I’m so excited for this! TL;DR, bad year, no posts, big new wolf story, two people writing, epic intro. I hope you all had a fantastic Christmas and a very happy New Year! Harris Burdick stories are short, fictional stories the author makes up based on only three things: title, picture, and caption. The stories range from scary, funny, to happy, somewhere in the middle, or everything in one story. “Ugghhh…” I groaned as I woke up. “Where am I?” I asked the empty, pitch black space I was in. “Perhaps a more valuable question would be, how are you?” Some high pitched, robotic voice asked me. “Ack!” I yelled, leaping up to my feet, ready to face a who, or whatever was there. “I mean no harm, sir.” The voice said. “I don’t believe you,” I said. “I am the monitor of installation zero-three.” The voice said. Then I saw it: it was a blue and grey floating orb, about four feet off the ground.”My creators call me three-four-three Guilty Spark.” The robot said. “Wait… My kind?! Does that mean there are other species! ?” “Affirmative” was all I heard. Spark started saying something else, but he sounded distorted. All I did hear from Spark was “Save your planet… Save The Ark…” “Spark!” I screamed, but got no answer. Then I started getting nauseous and lightheaded. “Ugghhh…” I groaned. “Wake up! C’mon, Kyle, wake up!” Henry screamed. I saw that we were back in “The Place” again where the first portal opened. We were back in that amphibious boat we built, going down that same track. The final portal opened up ahead of us, and there wasn’t much we could do. So we went through and we ended up back home. Back where we built the boat. Back in my basement. So I told them about my dream. I told them about three-four-three Guilty Spark. I told them about The Ark. I told them how Spark said The Ark might be in our moon. “Wow. That was some dream.” Josh said. “But how do you get to the moon?” He asked. “Honestly, I dunno. Ask NASA, I guess.” I replied. “When would NASA let us go to the moon? !” Henry exclaimed. “Yeah, good point. They probably wouldn’t let us go to the moon.” I replied. We fought. We both fought hard. Spark had some sort of laser he shot at me. Spark pinned me down with his now red-and-gray head for a body. I looked over to my friends and mouthed “now” to them. “Aaaaaahhhhhhh!!!! !” I heard Henry scream like a madman. He hit Spark in a flying tackle, knocking him off of me. I pinned Spark down with my foot.”Henry, go get some water. Please.” “On it.” He said. Paul and Josh asked if there was anything they could do. “No. Just wait. I’ll tell you if you can help.” I told them. Henry came back with the water bucket.”Can I have the water?” I asked Henry. “Sure.” He handed me the water bucket. I dumped it on Spark. “That’ll keep him out for a while.” Paul said with a stifled chuckle. “Goodbye, three-four-three Guilty Spark.” He said. Heh. Spark thought he was legend. Not anymore. But the sad thing was, we never found The Ark. Special thanks to Chris Van Allsburg, for, thirty-three years ago, writing The Mysteries of Harris Burdick, inspiring me to finish up Another Place, Another Time. “Look!” I yelled. “Another portal!” Everyone looked over to where I was pointing, and sure enough, someone said “Huh, you’re right. Another Place, probably. Home.” Home. The word sounded foreign, even though we’d been here only five minutes. So we went through another portal to somewhere else. It was home, alright, but everything was and felt different. “The first portal will bring one to the future. The second will bring you to the past. The third will fix it all, very very fast.” Author: Harris Burdick. I’ve heard that name! I thought. He was crazy. Heh. Maybe not. Harris vanished a few years ago. Nobody knows what happened. Some say he was kidnapped then killed, which, in reality, wasn’t far from the truth. “We have to go, Kyle.” I heard Henry say behind me. “How? There aren’t any portals around here.” Paul said. The very second he finished saying that, another portal opened up nearby. “Spoke too soon.” I heard him mumble. We all went through, and it looked oddly familiar. It looked like the house my family moved in to when I was ten. Is that Mom?! I thought. It certainly looked like Mom, but I couldn’t tell. Even stranger, I saw myself, as a child, sitting at the table my mother was at, doing math. “Stay down, guys. I think I remember this.” I peeked over the kitchen counter, then all of a sudden, I heard fighter jets roar by. My mom and I ran out on to the deck and looked for them. I had the feeling we should get out, so my team and I ran out the front door, down our driveway, on to the street, then I saw it. Another portal opened up, more spectacular than the rest. It was purple and gold in color, and had a light blue core. “Look!” I shouted, gesturing towards the portal. The rest was a little blurry for me. Ow. I thought. What was that? More blur. Ow. More pain. Blur. Stay… awake… Darkness. Then I had a dream. A dream too long to explain now. 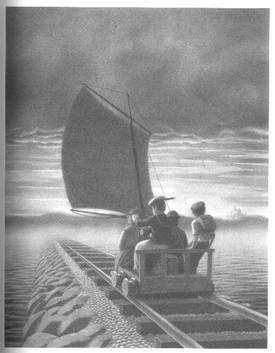 Special thanks to Chris Van Allsburg, for, 33 years ago, writing The Mysteries Of Harris Burdick, inspiring me to write Another Place, Another Time, Pt. 2. “Uuuhhh..” I groaned as I woke up. “Where am I?” I still felt that stinging pain in my back, but it mostly came to my side now. My ribs, I thought. If my ribs are broken, what next? No one’ll believe me when I tell ’em. They’ll think I’m just telling a story. I thought. Then, all at once, my groggy brain registered my friend Elijah Likens standing by my hospital bed, water pouch and all. Elijah is one of my best friends. We even have a secret handshake. It was now I found out I was in the hospital. He told me. “How you doing, man?” He asked me. “I think you know the answer to that question, Elijah. I’ve been better.” I replied in a slurred voice. Then I told him about the hump under the rug and the pathway below the house and the monster that was the hump. “We need to take care of that, Kyle! I’ll call some friends.” “No.. no. I’ll take care of it.” I said slowly. “We’ll take care of it. If you get bitten or stung or whatever by that thing again, you’ll never survive.” Elijah said. “Yeah, but it’s my problem. If anyone that’s helping gets hurt, I’ll regret it for the rest of my life.” I replied. That was the end of our conversation. I thought killing it was the best plan, although I had no clue how to. Putting it “back” into the wild, however, I could think of doing, though it could put someone else’s life in danger. What if I sent it to Animal Control? I thought. Then they can take care of it. They’re the professionals, not me. Then it was settled. I would capture it, send it to Animal Control, and let them decide what to do with it. So I tried to capture the thing, using a mouse I found in our chicken feeder as bait. And I waited. And waited. And waited some more. Then it finally came. The monster grabbed the mouse, and I managed to wound it with my stick. I ran over to the couch that was holding my net and I actually managed to catch it. So I called Animal Control and told them I had an unidentified animal I caught. They said they’d be right over. When they were over at my house, I manged to knock whatever it was unconscious. Animal Control took it back to wherever their base is. Before they left, I told them that the most guarded cage they had, use it. Because that thing’s unpredictable. The next morning, my parents were nowhere to be found. Then when I turned on the news, the first report was of something escaping from Animal Control. I knew that I’m not out of the woods yet. Because things are just getting started. Special thanks to Chris Van Allsburg, for, thirty-three years ago, writing The Mysteries of Harris Burdick, inspiring me to write my first part two for Under the Rug. There was an odd house on Maple Street, the street I lived on. The owner of the house invited my family over when we moved in next door. The house was nice, but there were controls for something in the basement. When I asked the homeowner what they were for, he just said they were a work in progress. This piqued my interest (and curiosity) to see what they were for. So that night I planned to see what they were for. And I really shouldn’t have. As soon as we got home, I found my all-black clothing and planned to “break in” that night. As soon as my parents went to bed, I sneaked out of the house and went through the neighbor’s back door. Luckily, he was at some fancy dinner or something, so I didn’t get any trouble from him. when I got to the basement (it took awhile because I couldn’t remember which door it was to the basement) I started flipping switches and pressing buttons, desperate for something to happen. But when I learned that nothing happened, I gave up and went home. The next night I did it again. I could swear I heard engines of something, but couldn’t put my finger on what. Every night I would try again, but pressing buttons and flipping switches in different orders. The fifth night I heard the engines again, but with it a lifting feeling, like taking off in an airplane. When I ran over to see, it was too late to jump. It was a perfect lift-off. I was scared to death. I searched the house-rocket for any parachutes (not that I’d know how to use them) or anything that would make my descent easier. But there was nothing. Nothing at all. But what I did find were space suits. I heard about Moon Base Beta and all the people that lived there. I wondered if I was landing near there. I was gonna brave it. One year later, I landed. Not on the moon, but on Mars. And I had no fuel left to get back home. Special thanks to Chris Van Allsburg, for, 33 years ago, writing The Mysteries of Harris Burdick, inspiring me to write the sixth, The House on Maple Street. I was scared of many things, among them being aliens, zombies, the principal, and many other things. But all of those are nothing compared to what I found under my family’s living room rug last week. My name’s Kyle. Kyle Meek. Every day I got scared of something, from the principal at my school, zombies, bad dreams about shape-shifting aliens from the Andromeda galaxy, and much, much more. All the kids at school call me a “scaredy-cat”, and I know what they’re talking about. But sometimes I can be brave. Like when I stood up for my friend Katrina when some bullies were picking on her. She’s still one of my best friends. But I was all proud of myself for fighting the monster under the rug. So I might as well tell you about it. Every night I would check under my bed for monsters. But I never thought of checking under our family’s rug for monsters. It all started when I saw the little hump under the rug in our living room. I looked there, and whatever was there disappeared. The next day after school, it happened again. I checked once again, and nothing. I was still fairly scared of it, so I called our German Shepherd named Liberty over. “Libby! C’mere, good girl! I have a treat for you!” I yelled up the stairs. Down she came, expecting a treat. When I lifted the rug so Libby could catch whatever was there, I found that there was nothing there. Three weeks later it happened again. So I grabbed a lamp and smashed the rug with it, but the only thing that happened was the lamp shattered into hundred pieces. Strange, I thought. I’ll try the chair next time. Sure enough, tomorrow the strange hum in the rug happened and I grabbed the chair by it’s legs and threw it with all my might against it. But again nothing happened. Then I took a peek under the rug. And I couldn’t believe my eyes: I saw a hideous monster crawl back into a secret hatchway that went below the house. So I decided I would wait for the monster and kill it with my dad’s big knife. But just as I was going to get the knife, I felt an immense amount of stinging pain in my back. “Three weeks later, it happened again.” Unknown artist/site. Special thanks to Chris Van Allsburg, for, 33 years ago, writing The Mysteries of Harris Burdick, inspiring me to write the fifth, Under the Rug. This is a review on Star Wars Battlefront. More specifically the new one, released in April 2015. The game is a shooter-style game with Heroes (classic Star Wars characters like Luke, Leia, Han Solo, Darth Vader, one of my all-time favorite Heroes, The Emperor, and Boba Fett), Starfighters Heroes for Starfighters, like the Slave I, Millenium Falcon, Darth Vader’s TIE Advanced, and Luke Skywalker’s Red Five. There are many modes to play, like Battles (my favorite!! ), a versus-type faceoff to see who has superiority in the galaxy. There’s also Survival, an increasingly challenging wave-based mode in many different places like Sullust, Tatooine, Hoth, and The Forest Moon of Endor. There are also Skirmish battles that include Walker Assault, an attack-and-defend gamemode. Also in the Skirmish menu, there’s Fighter Squadron, a Starfighter mode in which you have to destroy enemy troop transports, but not let yours be destroyed. Fighter Squadron is my second-favorite game-mode, behind Battles. Star Wars Battlefront features Star Cards, power-ups (with cooldowns) like Jump Packs, Grenades, Sniper Rifles, Sidearms, and many more. There’s also special Star Cards, like Personal Shield, Scan Pulse, Explosive Shot, and more. My favored loadout is Jump Pack, Thermal Detonator (or Scout Pistol), and Personal Shield. The graphics in this game are great! They’re not as good as some other games I know, but still amazing! Load time, however, could be shorter. I think load time is about five minutes on average. These are just my experiences on the Xbox One, though. If you get better load time on a PlayStation 4 or a different edition of the game (listed below) let me know in the comments. But the music is incredible! The soundtrack is classic Star Wars trilogy, and still amazes me how orchestrated Star Wars music is. One downside is the lack of campaign. I think the game would be much better single-player if there’s a campaign. There are many other gamemodes like Heroes vs. Villains, Hero Hunt, Droid Run, Blast, Supremacy, Drop Zone, Cargo, and many, many, more. These expansion packs include Heroes, Maps, Gamemodes, and more. There are four editions of the game, some have something extra, but cost more. Standard Edition: Basic gameplay and default starting. Deluxe Edition: Digital exclusives like credits, Emotes, and Star Cards. My father and I have this version. Darth Vader themed PS4 bundle; Sony and Lucasfilm gave these away in Twitter sweepstakes. Ultimate Edition: Season Pass, digital exclusives. Overall, my opinion is 6 to 7 out of ten. I’m super happy with the game, although I think I would give it an eight or nine if it had a campaign or even just a better single-player experience. I would recommend this game if you have Xbox Live Gold or PlayStation Plus subscriptions.